Despite not being nearly as famous as the big name fangame developers, Donitz has had a pretty good run so far with his line of creepy fangames. Story of the Blanks is undoubtedly his most famous creation, while Twilight vs Walking is more remembered for its difficulty than its Twilight Zone-inspired twist at the end. Since according to him "everyone, their mother, their dog and evil clone" had already made a Slender clone he decided to make one himself, and the results can be seen in his newest game "Derp till Dawn". Dous the humorously unfittingly-titled Derp till Dawn live up to Donitz's other respectable fangames? To find out, head below the break to read our review on it. 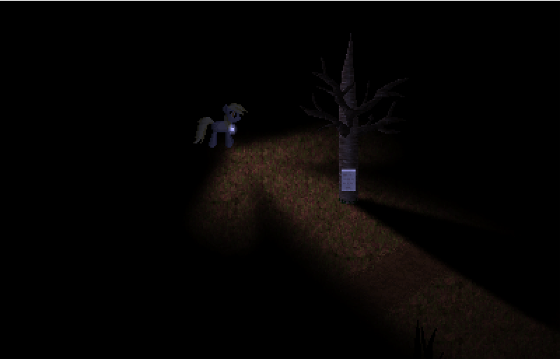 As with most Slender clones, Derp till Dawn takes place inside a dark forest centered around finding several pages and trying to avoid the dreaded Slenderman (or in this case, a Slenderpony). Unlike most of its peers it does tell a story, although it is kept quite vague and mainly told through the pages you collect throughout the game. It also takes place mainly from a top-down perspective, but upon going indoors the game switches to a first person viewpoint that would have reminded me fondly of Doom if it wasn't for Derpy's mane getting in the way of my vision and breaking the immersion. 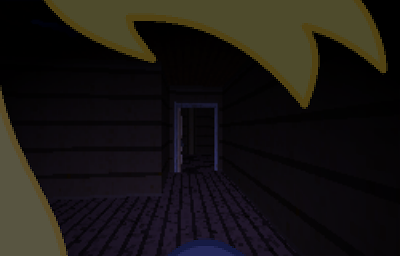 In a horror-centric game, having a scary atmosphere is key. A forest at night is spooky enough without elderitch abominations mucking about, but unfortunately both Slender and Derp till Dawn slipped up in these areas and made it feel more like walking through a vast, flat field of telephone poles, with the occasional bathhouse or camper lying about. In your average forest one would expect to at least find some little streams, hills and whatnot: in here you can't even find a single stinking bush! 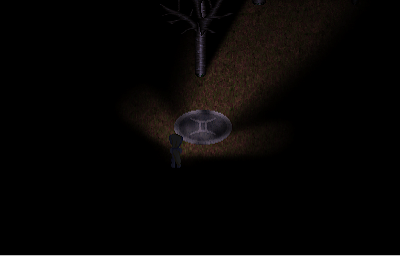 The game's first portion also had a distinct lack of dark purple which would have contrasted well with the green and given it an aura of mystery: unfortunately the caves below the well utterly abuse the most garish shade of it and feel more like something out of a cheesy "Barney's Dungeon" WAD than a horror game by one as talented as Donitz. Even if it looks and feels right, a horror game will fall flat if the audio was only an afterthought. Derp till Dawn has its fair share of unnerving music and scare chords, and like the original Slender you will be met with a scare chord and some static when you stumble across your well-dressed stalker. Some forest ambience sounds such as the ones used in Derpy's Story would have greatly increased immersion, but the place already feels dead anyways so there isn't really much of a point to it anyways. Ah well, at least the music is quite effective. Some ominous circles of doom. I've said a lot about the graphics and audio already, so how about the gameplay? Pretty much it's just Slender in 16-bit and viewed from an isometric perspective, or at least until you head indoors and things go all first person. It's a unique twist on the experience, sure, but the problem is that the indoor portions are infinitely more scary than wandering around in the "forest". Some might find it scary for a while, but given the game's over-reliance on jump scares it just becomes annoying after several deaths. A couple puzzles would have been a very welcome addition and helped with breaking up the overall monotony. My original hopes for Derp till Dawn were quite high, although after playing the game I must say that it did not quite live up to my expectations. As technically impressive as it may be for a Flash game it lacks polish, and if only Donitz had delayed release for a little bit, gotten some feedback from playtesters and made some relatively simple changes it would have been an incredible experience. At least it's fun for the first while, and if you're looking for some jump scares then this might keep you entertained for a couple minutes.